FMGE Application Form is available now. Foreign candidates for those who have medical qualification and wanted to register with Medical Council of India, or any of the state medical council of India may apply for FMGE. Candidate can apply through FMGE Application Form details given below. FMGE Application Form are available in Online mode only. Interested candidates may apply online through the website or from the link given below. In this section, candidates will enter basic contact information. Once the candidates have successfully created their profile, they will be taken to the exam selection screen. To register for FMGE, please select The Screening Test for Indian Nationals with Foreign Medical Qualifications (FMGE) from the drop down menu. Candidate may note that there is no option for submitting the form other than the online mode. Candidates are advised to go through the Registration Guide before proceeding to complete their registration & scheduling process. Once the candidate has completed his/her scheduling process, there will be no option to reschedule. Online registration & scheduling must be completed by the prescribed cutoff date. At the end of Registration process the applicant will get a computer generated acknowledgment. All fields marked * in the online registration form are mandatory. Please refer Registration Guide available on http://www.fmge.nbe.gov.in/ for instructions to fill online application form. SNAP Test Registration is Only those candidates who have registered and paid for ‘SNAP 2015′ will be eligible for the Institute SNAP Test Registration process. SNAP Test Registration is available Online for those candidates who are interested for doing MBA from Symbiosis International Institutes. 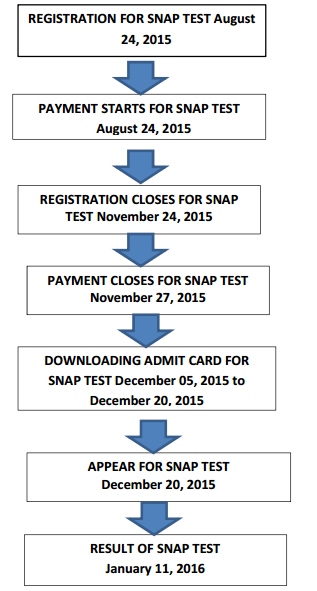 Detailed guidelines for SNAP Test Registration is given below. Register online on the website snaptest.org (from August 24, 2015 to November 24, 2015).or from the link given below. Click on the ‘I Agree’ button to accept the Terms. Then click on “Submit” to register. The screen will now display your SNAP ID. After successful registration, you will get an email containing your SNAP ID and password. Use this SNAP ID for all future correspondence of SNAP. Use this SNAP ID and Password to enter the online application form to make any modification to the details provided by you. To register for individual institute you should login using the same SNAP ID and password. Click on the ‘Click here to Continue’ link that appears along with your SNAP 2015 ID and proceed to make payment. The screen will now display the Make Payment options. Note: Any Changes in the online application form will be entertained only up to the closing date of Registration i.e. November 24, 2015. No changes shall be permitted after closing date under any circumstances. Upload his/her latest scanned coloured photo at the time of Online Registration for appearing to SNAP. Pay the test fee of Rs.1500/- as per the instructions mentioned on the website of the University for Payment of Test fee. (from August 24, 2015 to November 24, 2015). ONLINE PAYMENT THROUGH CREDIT CARD: The candidate may pay directly through Master or Visa card online by following the instructions on the SNAP website after the registration. ONLINE PAYMENT THROUGH NET BANKING: The candidate may transfer SNAP test fee to Symbiosis Test Secretariat account using Net Banking option after the registration. PAYMENT THROUGH CASH: After online SNAP 2015 registration print ‘Axis Bank or Indian Bank Challan’ from the SNAP website. It is in 3 parts. Pay Rs. 1500/- in cash at any Axis Bank or Indian Bank branch in your city. PAYMENT THROUGH DEMAND DRAFT: Obtain a Demand Draft (DD) of Rs. 1500/- from any Nationalized Bank in favour of “Symbiosis Test Secretariat” payable at Pune. For Institute registration and payment, please visit the particular Institute’s website. NRI candidates are requested to check the eligibility requirements on scie.ac.in before registering for SNAP Test 2015. GOAPS: GATE Online Application Processing System (GOAPS website) has the web address appsgate.iisc.ernet.in. It can also be accessed from the website of the respective Zonal GATE Offices or from the website of the GATE 2016 Organizing Institute. Registration: A candidate must first register by providing a valid email address, mobile number and a GOAPS password. All communications from the GATE Offices will be sent to this email address (ONLY ONE PERSON CAN REGISTER WITH ONE e-mail ADDRESS).Give your personal mobile number because most of the communications may also be sent via SMS. GOAPS Password: The candidate chooses a password during Enrollment at GOAPS. This password must be remembered along with the GOAPS Enrolment ID to login to GOAPS. It is strongly encouraged to choose a password that cannot be guessed easily (it should not be the candidate’s name, date of birth, or some easily guessable string of numbers or letters like 12345 or abcd). will be sent to the candidate. Data Requirement for Application Filling: The following data will be required while filling the form at GOAPS. name, parents’ mobile number, etc.). Application Filling: The GOAPS allows you to enter data, “Save” partially filled form, “Logout”, and resume filling in by logging in again. The GOAPS portal is self-explanatory and user-friendly. Online help about using GOAPS is also available. Before you make the payment, you will be shown a “Preview” of your application, where you have to carefully check for any errors. application can be made by you. For online payment follow the instructions given for payment options. instructions on the GOPAS portal to retrieve them. Photograph and Signature Requirements – Maximum pixel resolution for JPEG: 480 × 640 (0.3 Mega pixel),Minimum pixel resolution for JPEG: 240 × 320. Signature SpecificationsPlease draw a rectangular box of size 2 cm × 7 cm (Height x Width) on an A4 whitepaper. Sign with black or dark blue ink pen within this box. Get the digital image of the rectangular box (with your signature inside) scanned by a professional using a scanner. Crop it to the border of the box.The maximum pixel resolution for the image is 160 × 560.The minimum pixel resolution for the image is 80 × 280. Upload photograph, signature and other documents like graduation certificate/ certificate from Principal, caste certificate (if applicable) etc. Pay the application fee through net-banking or debit card or e-challan.